Green Cleaning is a Hot Trend! A decade ago, the environment wasn’t much of a priority when it came to cleaning. Households across North America used products that had a variety of ingredients in order to clean their homes. These ingredients included bleach, ethanol, sulphuric acid and other chemicals. Many of these ingredients are impossible to say, much less spell. Studies have shown that these ingredients can cause health problems for humans, pets and the environment. People are turning to cleaning methods and products that have fewer chemicals. And more people than ever are creating businesses out of this trend. Green cleaning means using environmentally friendly products to clean homes and businesses. The products use natural ingredients in order to clean instead of the traditional chemicals and fragrances. But a green-cleaning business goes further than that. You should be eco-friendly in other aspects of your business if you are really committed to being green. This includes things like using energy-efficient equipment and using transportation that’s easy on the earth. 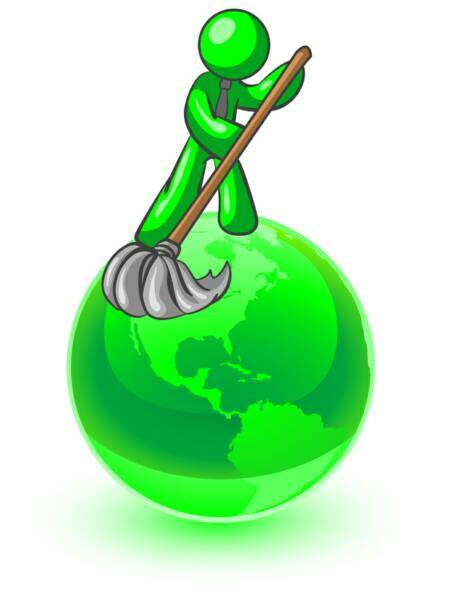 The number of green cleaning businesses on the market is growing each year. In fact, sales of green-cleaning products were $64.5 million in 2008. That’s according to Mintel International Group, a market research company. Mintel expects eco-friendly cleaners will do $623 million in business by 2013. That’s 30 percent of the total market for household cleaners. Ted Fagan is the president of Eco-Mist Solutions. His company creates plant-based cleaning products that are eco-friendly. He has seen an increase in green awareness. To get started in a green cleaning business, there’s one important first step. You have to figure out your business model. Do you want to clean homes or businesses with green cleaning products? Or do you want to create a new green cleaning product? No matter which option you choose, it’s crucial to do your homework. Read as much as you can about the green cleaning industry. There are lots of resources available on the Internet and in magazines. Like starting a business in any industry, there are costs involved. The amount of money needed to start a green cleaning business will depend on a number of factors. These include the number of employees, your location, the required equipment and the costs of advertising. Running a green cleaning business means wearing many hats. On a typical day, you could be meeting new clients, recruiting employees, cleaning homes, meeting suppliers and answering inquiries. Joe McCutcheon runs Triangle Green Cleaning out of Raleigh, North Carolina. He usually starts at 7:15 a.m. and ends his work for the night by 8:30 p.m. He says long days are typical for most entrepreneurs. Cori Morenberg agrees. She runs her own green cleaning business, Ms. Green Clean, in New York City. You’ll be fully immersed in the business, to be sure. It’s important to realize you can’t do it alone. Many eco-entrepreneurs say that “greenwashing” is a major issue in the green cleaning industry. Greenwashing is when companies dishonestly claim their products or services are eco-friendly. Demirdji agrees that greenwashing is a major issue. He recommends doing research and reading product labels. “Just because it says it is green, it doesn’t necessarily mean it is true,” he explains. Eco-entrepreneurs can gain customers’ trust by being open and honest about their products. They can also pursue eco-friendly certification through a respected source. Organizations that provide green certification include Eco-Logo, Green Seal and the Green Clean Institute. The best way to get started in a green cleaning business is to research, research and research. Look at what businesses are already available in your area. Talk to people about what they’d like to see as a product or service. Once you’ve found a unique niche in green cleaning, hash out a business plan on paper. This includes determining your business goals, your projected timeline and any anticipated challenges. But remember — your green cleaning business is still a business. McCutcheon says it’s important to practice good business in every aspect. “Our customers stick with us not only because we are ‘green,’ but also because we do a good job at cleaning and we are easy to communicate with,” he explains. Market research is always essential for the succes of any kind of business.’*. Wow! That’s astonishing… and encouraging. I can remember when 7th Generation first came out and being teased for spending so much on their cleaning products when “you could get it cheaper at Walmart”. I am very glad to see the frowth of this trend!